Sword Art Online has become an immensely popular series with quite the polarizing reaction. It’s not hard to see why. It’s an anime about a virtual reality MMORPG, and its ideas are firmly planted within the worldviews and fantasies of a very sizable but somewhat problematic portion of both the gaming and anime communities. More than that, it pursues those ideas very earnestly, which makes it quite appealing to some and quite laughable to others. I kind of like the earnest nature of Sword Art Online. It doesn’t always pander on purpose, and even though that does mean it really is absorbed in its own ridiculous power fantasy and sometimes downright harmful attitudes, it at least shows that Sword Art Online wants to be good. That helps to make Sword Art Online II a considerable improvement over the original series. It’s enough to make this an easy recommendation for fans, although not quite enough for anyone who didn’t like the original series. It pulls a lot more compelling ideas, all the while continuing to make similar mistakes. 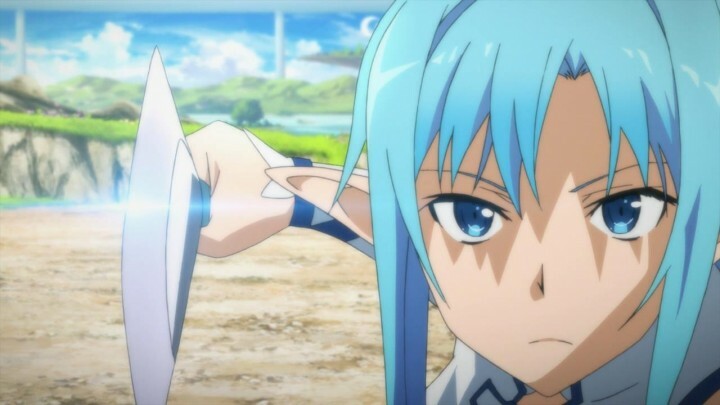 Despite that, Sword Art Online II demonstrates a series that honestly learns to be better. Sword Art Online II begins in the Phantom Bullet arc of the source material. Kirito finds himself in the virtual reality shooter Gun Gale Online (GGO), in search of a player going by the ridiculous pseudonym of Death Gun who’s believed to be responsible for murdering players through the game. He takes part in a GGO tournament, given the similarly ridiculous title of “Bullet of Bullets”, in order to garner Death Gun’s attention and get to the bottom of the mystery. Along the way he finds himself tagging along with Sinon, a young girl with a very much scantily clad character avatar who plays GGO to overcome her crippling fear of guns. GGO itself is a much more clearly defined setting than the previous ho-hum fantasy settings of Sword Art Online and Alfheim Online, with mechanics that are more easily understood and which the combat is shaped around. This allows the action set pieces to carry a lot more urgency and excitement than many of SAO’s previous flashy attack spams. There’s still not enough clarity to the functionality to engage with it fully as an actual game, but there’s just enough depth to make a pleasant spectacle. Sinon also happens to be a lot more defined than any other characters we’ve seen thus far in SAO. Kirito does have a tiny bit more personality this time around, and finally starts to feel bad about the people he killed while in SAO (although it’s not quite clear where all this came from), but it’s safe to say that Sinon is the more interesting of the two. She’s backed by a concrete character arc, one that happens to be decently compelling, if a tad melodramatic. Sinon sees games as almost being an absolute escape from real life. This is, to me, a potentially dangerous way to view games, but it’s a view that we’re made to understand emotionally. We learn that her fear of guns is built on a traumatic personal experience where she shot and murdered a robber. She shot him three times in typical enough accidentally over-the-top SAO fashion, but this backstory still outlines her conflict well despite that. When Sinon is in GGO, she’s empowered by the subconscious disconnect to not only use guns but to use them confidently, and so she sees GGO as a means of ultimately overcoming her real world fear of guns. 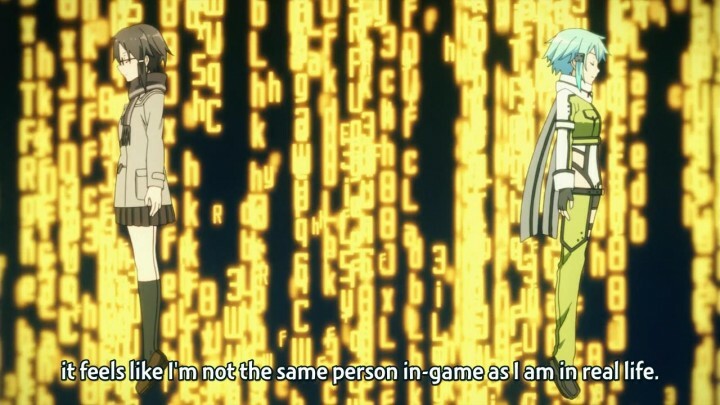 Like Sinon, many gamers also feel empowered by games, to the extent that it’s easy for them to believe that game worlds exist entirely in a vacuum. That’s essentially how we’re made to understand Sinon’s viewpoint. Unlike the first series, Sword Art Online II doesn’t simply brush over those ideas; it builds a tangible thematic core from them. There are certain obvious shortcomings from the first series that Sword Art Online II hasn’t fully overcome. In terms of pacing, it fares somewhat better than the first series in actually being able to pull some scenes together, such as the aforementioned action scenes. For the most part, however, it comes off as obviously padded, dragging scenes on and reiterating things we already know fairly frequently. Some anime adapted from source materials struggle with fitting a certain episode count gracefully. Sword Art Online II, despite doing a little better than the first time around, still manages to be a consistent offender. 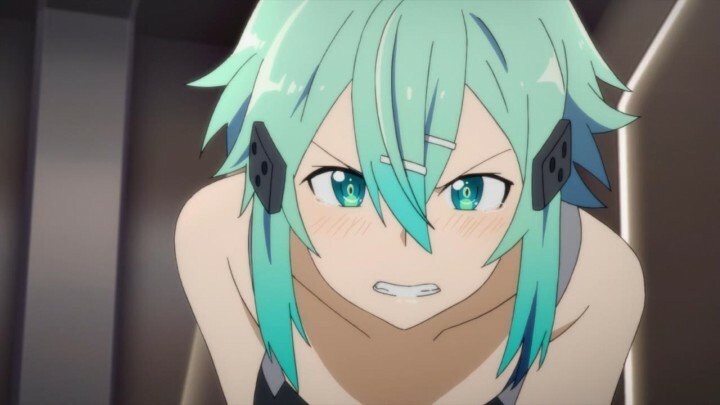 Aside from that, there’s still a pretty bad spread of dry light novel tropes: Kirito being the self-insert socially awkward but secretly special protagonist he is, Sinon filling in the role of the submissive generic tsundere — just a whole lot of the usual terrible bits and pieces that one would unfortunately expect from SAO at this point. Sword Art Online II manages to be a somewhat impressive step up for the franchise in the early going, although one still notably marred by many elements that severely damaged the original series. Its character work is all-around consistent, even generally respectable, and it manages to create something a little more interesting with its setting. Despite that, its structure is still far from elegant, and it still demonstrates a lot of questionable values. Sword Art Online II definitely still has some work to do. Episodes 8 to 14 of Sword Art Online II cover the second half of the Phantom Bullet arc. Thematically it hits the important touchstones in respectable fashion more than it doesn’t, but the padding gradually increases as it goes on. Most of the episodes past this point spend half their runtime getting through details and events that could be covered in half the time. 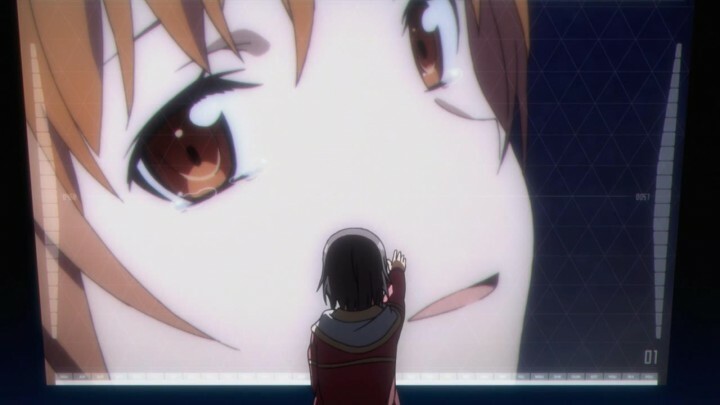 The dialogue between Asuna and the others spectating from ALO is almost entirely repetition of things we’ve already been told, with a side serving of more Kirito worship. Besides that, a whole lot of dialogue sequences are just tediously long and peppered with corny and tortured sounding lines (e.g. “And I will bring you true death with this gun”) — not to mention the anime often seems a lot more interested in Sinon’s rear end than using visual storytelling to elevate its dialogue sequences. To its credit, it does manage to make decent narrative progression on the whole, but it takes a lot more time to do so than it really should. Sinon’s arc crashes down into the dreaded “I wish I was as strong as Kirito” territory. As for Sinon’s character arc, the progression is a mixed bag. The concept of an in-game gun that kills people in real life gels well with her aforementioned backstory in the long run. It marks a clear obstacle for the dramatic progression of her overcoming her fear of guns, and it’s aided well by a few well-executed big moments and solid action scenes. Kirito’s own feelings of guilt over murdering players in SAO occasionally work as a nice counterpoint. 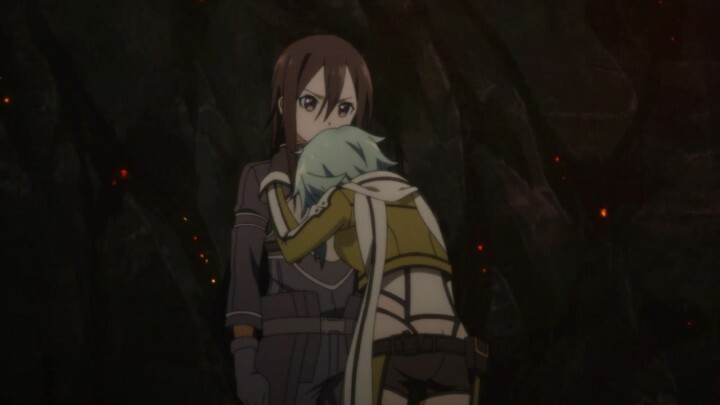 Ultimately, however, it eventually brings Sinon’s arc crashing down into the dreaded “I wish I was as strong as Kirito” territory, with her bursting into tears and yelling copy and paste tsundere lines before eventually falling into Kirito’s arms. It’s more than a little disappointing when a series like Sword Art Online, one that has such a reputation for its questionable treatment of women, manages to build a compelling female character only to repeat its old mistakes. The GGO part of the story ends well enough with a solid final action sequence where Kirito and Sinon defeat Death Gun, followed by a quirky little scene where Sinon blows both of them up to give them a tied victory in the Bullet of Bullets Tournament. Sadly, it happens to be followed by Sword Art Online at its very worst: using sexual assault as a narrative device. Many ideas in fiction don’t necessarily seem like they work on paper, but given the right execution can be made into something. Sexual assault is not one of them. Sexual assault is, on all levels, a disgusting way to create narrative tension. It’s made worse by the fact that the antagonist perpetrating this is essentially a caricature of one of those “nice guys” you see on the internet. The reason he attacks Sinon is because she didn’t want to go out with him — which is a real motive a lot of young men unfortunately have for resenting women — but not one SAO comes anywhere close to maturely representing. This scene drags on uncomfortably through a large chunk of the last two episodes of this story arc. It could be made shorter, but quite frankly I wish it didn’t exist at all. At the very least, Sword Art Online II is able to give the character of Sinon the respect she deserves in wrapping the arc up. 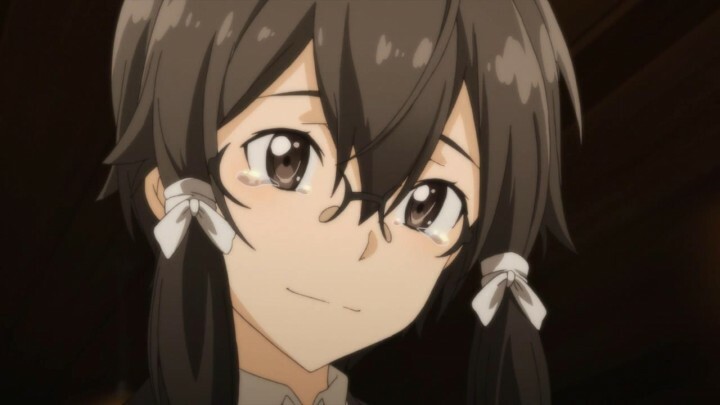 She overcomes her personal demons through her own will in the end, rather than the will of Kirito. That’s definitely an improvement for SAO, but unfortunately it doesn’t really save the second half of Phantom Bullet. This is a thematically successful arc, but it makes a fair share of the same crippling mistakes of the original along the way. 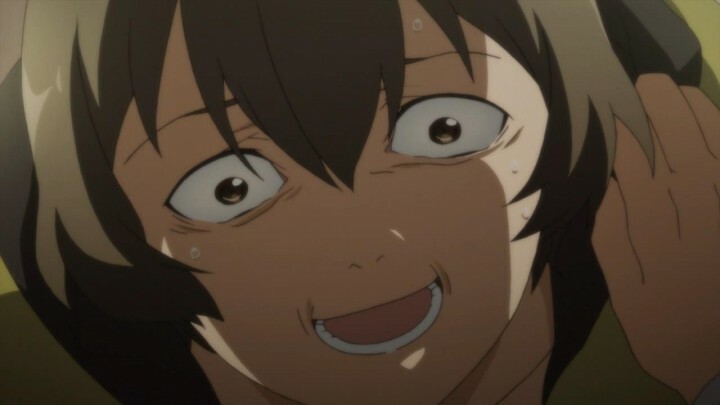 If Sword Art Online wants to be as good as it can be, it’s still got a ways to go, and it really ought to cut down on the inappropriate villains. With the Phantom Bullet Arc finished, Sword Art Online II finds that stretching out the previous arc wasn’t quite enough to fit the obligatory 24 episode count, so it goes into filler territory for three episodes with the Calibur Arc. It’s not filler in the typical sense of being anime original content. Rather it’s a side story from the original light novel that was slotted in. It hasn’t got a whole lot of meat, but it manages to carry some momentum through most of its brief run-time and come out alright. Characters besides Kirito get their time to shine. 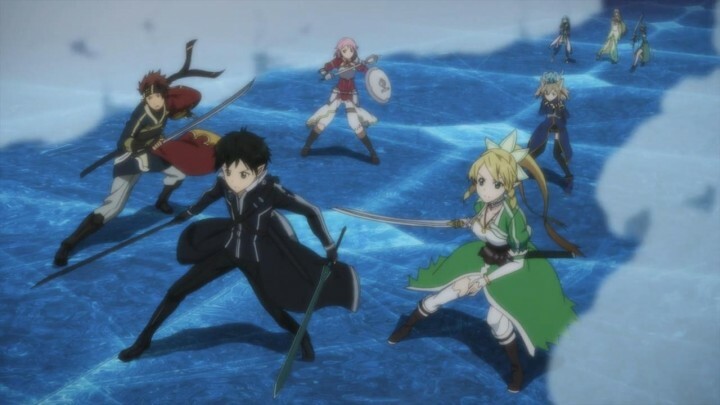 The Calibur Arc follows Kirito and the gang back to Alfheim, where they hope to complete a difficult quest to obtain the legendary sword Excaliber. Along the way they find things are trickier than they expected, and they now have to save Alfheim’s world tree from being destroyed by a tyrant named Thrym. It starts off bumpy by taking an entire episode to very dryly establish these details. Thankfully, it makes a good recovery and gives us a couple surprisingly solid action scenes in the second episode. Calibur wisely chooses to introduce more tangible mechanics to ALO, which makes the action scenes a tighter spectacle than they were in the Fairy Dance arc from season one. The big team dynamic also helps to bring a certain level of variety to the scenes, not to mention it gives characters besides Kirito their time to shine. The final episode of this arc is a middling affair. One thing leads to another and they find themselves teaming with Thor (yes, that Thor) to conquer Thrym in a decent action sequence, Kirito gets Excaliber, Kirito throws Excaliber away, Sinon retrieves Excaliber, Sinon flirts with Kirito, Klein almost gets lucky with an NPC and the day is saved. Not super thrilling, but not overtly dull or frustrating or creepy, which is a good enough place for Sword Art Online to be. And so Calibur ends on a comfortable neutral. Sword Art Online II’s Calibur arc isn’t exactly stepping up, but it’s certainly watchable on the whole. Though it indulges in some of the series’ bad instincts with some garden variety harem gags here and there, it never goes any further off the deep end than that. For a short inoffensive arc with such a clean-cut fantasy plot, simply having the couple of solid action setpieces it does carries it well enough. I definitely wouldn’t go out of my way to recommend the Calibur arc, but if you’ve stuck it out this long with Sword Art Online you can probably bear to watch this one. So now we’ve reached the end of the ride with Sword Art Online II, moving into the Mother’s Rosario arc. I have to admit, when reviewing this series, I started to feel like a teacher with a pupil who tries hard but never really catches up to the other kids. There was a sense of guilt in being harsh towards a series that I really wanted to be as good as it could be, but for all its improvements it never quite kept my investment. For that reason, I think it’s a blessing that Sword Art Online II can end on an arc as good as Mother’s Rosario. It still makes some of the same mistakes, but it doesn’t allow itself to fall on them, and it reaches the finish line in far better form than it ever has before. 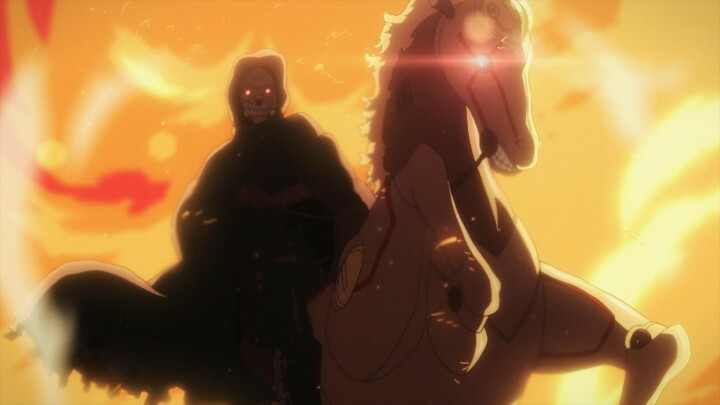 Once this arc gets off the ground, it starts to be more impressive than SAO has ever been. Mother’s Rosario is a fairly simple dramatic arc. Asuna meets a girl named Yuuki in ALO who wants to create lasting memories with her guild. 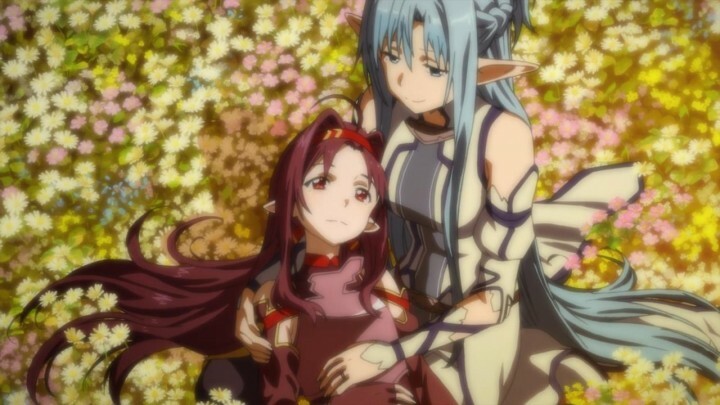 Asuna eventually learns more about Yuuki, and the two form an invaluable bond before they have to part with one another. As with every other arc in Sword Art Online II it starts off slow with a fairly empty and talky episode, only imparting a few mildly interesting tidbits such as glimpses of Asuna’s tense family relationship. Once it gets off the ground though, it starts to be more impressive than Sword Art Online has ever been. Its first smart move is putting Kirito on the sidelines and allowing Asuna to be a character on her own. Although the series can’t quite part with its love affair with him and brings him back a couple of times for him to do random stuff to look cool, the meat of the story is strictly about Asuna. Following the first episode, there’s a very nicely executed scene between Asuna and her mother that sets up an underlying human conflict with by far the most believable antagonist the series has had. 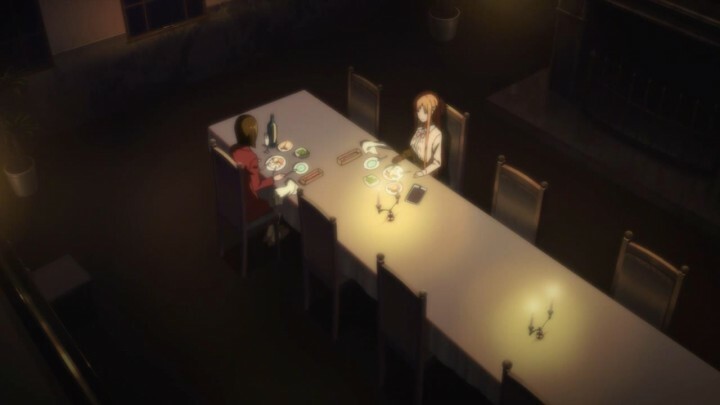 The tension between them is made subtly implicit by the framing of their scene, with the two of them sitting alone at a massive dinner table in a dimly-lit room. The mother speaks about Asuna’s future career as if it were a professional conversation by firmly emphasizing the importance of getting the most options, rather than encouraging her to do what makes her happy. The issues they discuss speak true to the conservative work-focused culture of Japan. For example, there’s the issue of arranged marriage for socioeconomic purposes, presented here as a decision made by Asuna’s family that she actively objects to. Compared to the first series situating her as a beloved prize being taken away from Kirito, it’s definitely a much more nuanced representation of this issue. This creates a generational conflict of sorts between the two, further emphasized by the mother’s hostility towards both the social and educational uses of technology. The anime doesn’t do the leg work of exploring these issues specifically, but it maturely acknowledges them and creates a believable conflict around them. The conversation ends tensely with Asuna insisting that her mother is upset by her own less advantaged upbringing, the kind of heat-of-the-moment line you get from a family argument. Despite that, the mother’s anger at the line shows it evidently exists within an emotional truth, which humanizes her and establishes her as a compelling antagonist. I’ve mentioned a couple of times now how the action scenes have been an improvement over the first season, but not really as much more than a decently constructed spectacle. Mother’s Rosario manages to take things further, demonstrating dramatically grounded action setpieces. The fight between Asuna and Yuuki was the first time I felt that the series managed to pull off an action scene with a real sense of tension. Not tension in terms of high stakes, but tension in terms of being able to feel the two battling it out. To feel the momentum shift as they turn the tables on one another. To feel that there’s two distinct characters who are part of a story and who are displaying their own personalities. Those are the kinds of things that I appreciate in good action shounens like Hajime no Ippo and Hunter x Hunter. Although Mother’s Rosario doesn’t have enough great elements in its action scenes to be on the same level as those two series, it does a very solid job on the whole of bringing together the core elements that turn action scenes into something a little bit more than a nice spectacle. Whether or not you like Mother’s Rosario may come down to its big dramatic arc, which definitely lays things on heavily. There are a couple of scenes where it dramatically overreaches, another mistake that’s plagued this series since the beginning. It also doesn’t always have a continual thematic progression, moving laterally on a few occasions to advance the plot. Despite that, I was truly invested in the story. I could root for Yuuki and feel for her simply because she was a charming character. But more than that, I felt that the story eventually did build a serious investment with the character by simply allowing her to be intimate with Asuna. This intimacy builds gracefully into empowering Asuna to confront her mother’s hesitance to believe in virtual MMOs as a social tool. It’s by communicating in the virtual world that Asuna is able to have a heart to heart with her mother, an idea I can personally relate to. When I was 14 and full of social anxieties, I found online communities to be the most empowering thing I had. There was a physical distance that made me feel safe with opening up to people, with developing a sense of emotional closeness and coming to understand others. I never quite explained the idea of being friends with people I’ve never met in person to my dad, so it’s a cathartic moment for me when Asuna is able to open up in the virtual world — to reach past the generational gap and create a sense of mutual understanding. 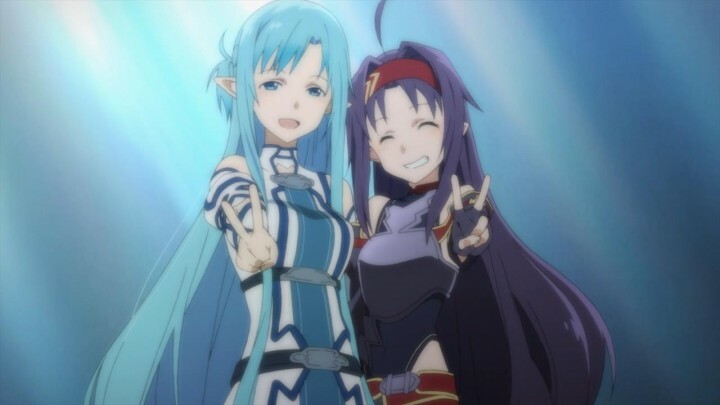 Although virtual worlds are often a potentially dangerous escape from reality, which SAO2 showed earlier with Sinon, Asuna learns through Yuuki’s experiences that there’s truly something real to be found in them. 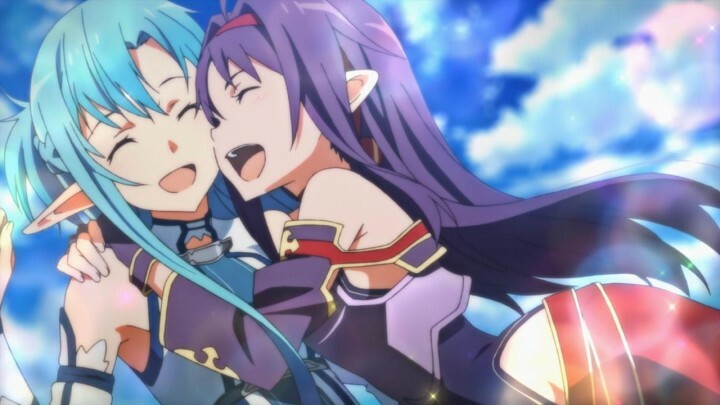 And so we reach the end of Yuuki’s journey, and Sword Art Online II manages to make me weep a little despite the splashes of corny dialogue and the absurd tens of thousands of players who come to see Yuuki. With all the construction around ideas of the power of virtual worlds, it comes back to the poignant reminder that reality is inescapable, but still urges us to appreciate virtual worlds for what they give to us. Thus, despite its odd weaknesses, Mother’s Rosario manages to avoid being consumed by the worst mistakes of Sword Art Online and finishes off the second season on a thematically and emotionally satisfying note. 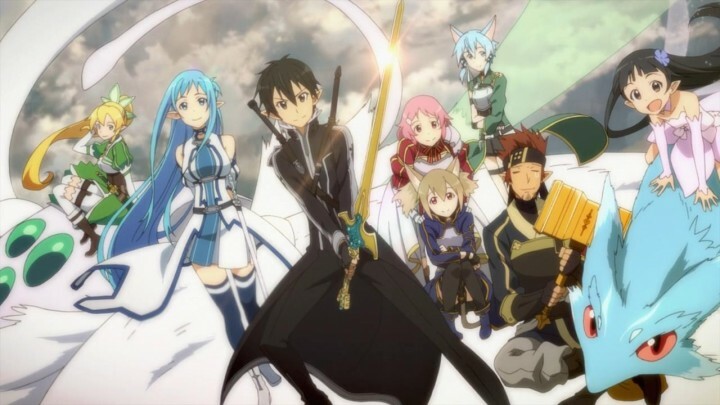 Sword Art Online II is the mark of a series that wants to be good, that wants to be better. It stumbles in its first arc from tedious pacing and a few creepy and unpleasant ideas, and it dawdles around in its second arc. But in the end, it manages to deliver. It manages to pull together and hit the right beats and finish as a better series than when it began. It definitely won’t win everybody over, especially given the time it takes to firmly plant its feet on the ground, but it was enough to make me happy. I can only hope that the inevitable follow-ups continue to get better.